Made by dependable Remington, the RM110 Trail Blazer gas-powered lawn mower has heavy-duty features but is easy to use and push at a doable 62 pounds. Its engine is powerful and reliable, and the 21-inch cutting deck offers a wide path for less passes during the job. Clippings get expelled on the side or bottom, minus clumps, depending on which 2-in-1 mowing option you select. I said “minus clumps” because the SuperCut™ cutting system lifts grass and circulates it underneath the deck. This breezy effect that you can’t even see makes for great mulch and a cleaner mowing experience. Depending on the time of season and conditions in general, you can select from six cutting heights using a dual-lever adjuster. This machine has a nice, comfortable handle that you can adjust, so folks of all sizes can use it. It’s best used on yards that are one-fourth of an acre or less. Mowing season is upon us, and who doesn’t love a mower that starts right up with one pull. That would be the case with the Trail Blazer, whose 132cc overhead valve engine is well built, reliable, and powerful. With three or so pumps of the primer button, you should be able to start it right up, even in 40-degree weather. Once you get going, you’ll see that the Trail Blazer’s wheels–7-inches in front and 8-inches in back–can handle uneven and slippery terrain well thanks to their deep tread which offers outstanding grip. And I jumped ahead of myself a bit by forgetting to mention that those wheels can be adjusted with a dual-lever height adjuster and have six settings. The mower’s small turn radius and wide cutting path makes for an efficient machine. The 2-in-1 deep-dome steel deck has a SuperCut blade that allows you to mulch or do side discharge. Whatever option you choose, long grass is a thing of the past with the Trail Blazer. Like I mentioned, the Trail Blazer should start up on the first pull, and once it does, you’ll like the comfy comfort-grip handle and the way it absorbs vibrations, easing the shaking on your hands. 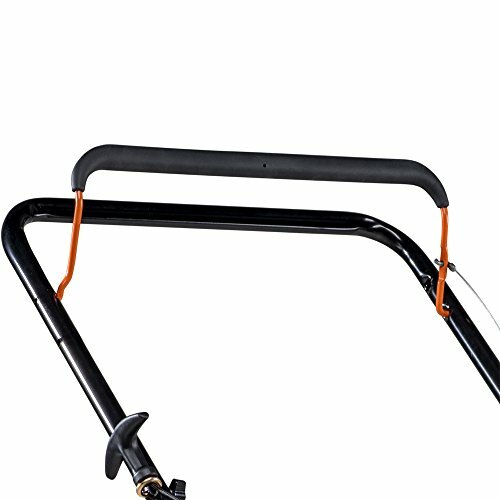 The handle is also adjustable, so taller folks won’t have to slouch, and those on the shorter side won’t have to feel like they’re reaching upward as they mow. At a reasonable 62 pounds, the Trail Blazer is not going to wear you out too much. 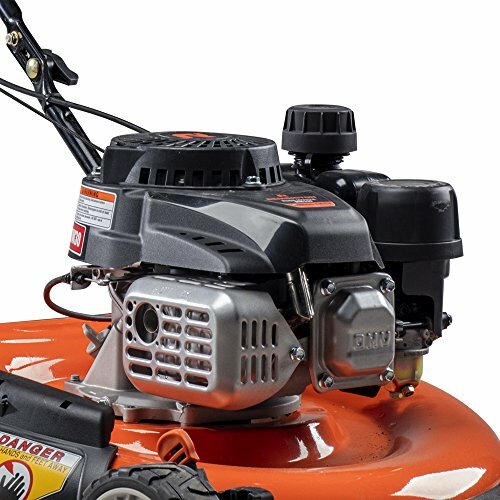 The handle can fold inward and retract, though you do have to undo four bolts, which mean this mower doesn’t take up much storage space and is easy to transport if you need to put it in a truck or the back of a truck. When that blade needs sharpening, or if you need a new one, you’ll appreciate how easy it is to take on and off. What’s not as easy is the oil-fill area, which requires you to access the bottom of the engine and then use a long-spout funnel to add the oil so that you’re not spilling it all over the deck. But other than that, assembly is easy and straightforward. The mulching option is especially a treat on this mower due to the fine way clippings get sliced and diced via the SuperCut system, which lifts grass and circulates it in a deep-dome deck. It’s great to use a mower that mulches without clumps and can disintegrate oak leaves into nothing after a few passes. 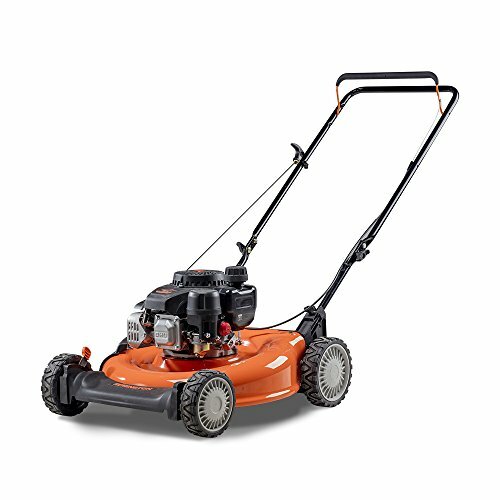 This well-built 2-in-1 mower can also discharge clippings to the side if you choose not to mulch. The 21-inch deck offers a solid cutting path for less passes. If it was 22 inches it would be even better, but that’s being nitpicky. 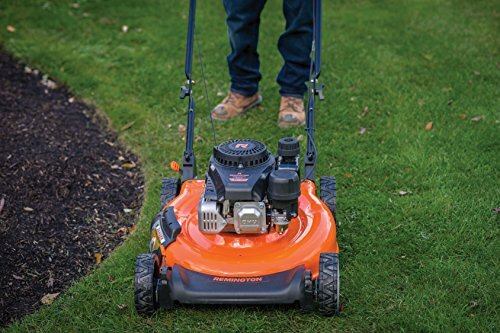 The engine is powerful enough to tackle grass that’s too tall for its own good, but be sure to raise the wheels to their highest settings if you’re dealing with grass like that; otherwise, the clippings may clog things up. Add the included oil prior to using the mower. Lubricate the pivot points on the blade control at least once a season with light oil. Clean the deck after each use or as much as possible for optimal performance. Maintain oil level as instructed. Service air cleaner after every 25 hours of use. Clean the spark plug and reset the gap once every season. Clean the engine regularly with a cloth or brush. Periodically inspect the blade for damage and sharpent when needed. Take the necessary steps to store the mower properly during the off season. View the owner’s manual for all maintenance suggestions. The blade control on the handle will engage the mower and disengage it at once if needed. This The Trail Blazer’s best feature is probably its rust-resistant, deep-dome deck. Underneath that deck is a specialized cutting system that lifts and circulates grass so that things won’t get clumpy. The blade on this thing really gets the job done. Whether you’re mulching or discharging clippings, the Trail Blazer does a good job of keeping yards looking pristine. It also has a foldable handle, a comfortable grip, six height adjustments, grippy wheels, and a solid engine. 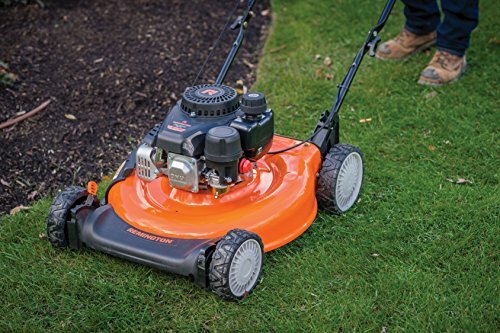 It’s a widely accessible mower that is lightweight enough for most to push, and the adjustable handle is practical for people of all sizes. 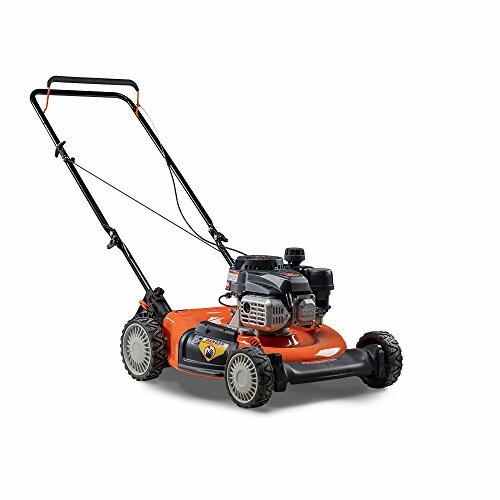 This mower has a middle-of-the-road price that reflects its sort of every-person appeal. No, it doesn’t have all the bells and whistles one might want. Its dual-lever wheel adjustment is not as easy as a single lever, and that’s just one example. Still, I like its practicality and durability. It’s built to last and should last, provided you maintain it every season. It likely doesn’t guzzle gas as much as a self-propelled machine, and because it doesn’t have a bagging option, I’d say it’s a highly efficient mower. Use the mulching option and you’ve got free fertilizer every season, plus you won’t have to deal with annoying clumping that can take time to clean up.